CBD oil, or cannabidiol, is the new, revolutionary medicinal cannabis product with the potential to change your life. The non-psychoactive compound from the cannabis plant has an ever-expanding portfolio of medicinal benefits and you can use it to reach your highest potential, naturally. Author of ‘CBD for Total Wellness’ and CBD expert Robert Fergusson shares proven techniques to help you achieve real results. What it can do for you! The mental stress and physical ill-health related to depression, pain, anxiety, acne, cancers, hormonal changes, degenerative diseases, autism and more can impact the quality of your life and the lives of your loved ones. You do have a choice when it comes to treatment. Anxiety, depression and other mental illnesses. Aches and pains; including arthritis and joint pain. Autism and its symptoms - even in children. Chronic skin conditions such as acne and eczema. 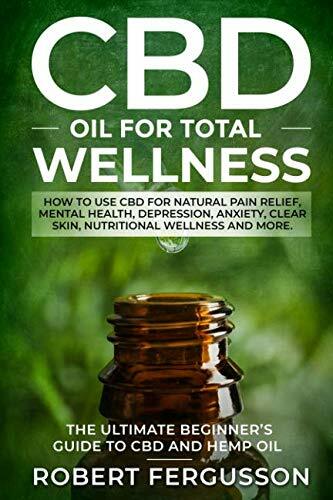 'CBD for Total Wellness' includes recipes for edible and cosmetic applications, as well as tips on how to use CBD in other ways.